Date of Birth : 12 th August 1957 Jaunpur, U.P. Presently Reader in the Dept. of Drg. & Painting (Fine Arts), M.M.H. College, Ghaziabad. U.P. (Ch. Charan Singh University, Meerut). 1985 Ph.D. Folk Art of Eastern Uttar Pradesh under the guidance of Prof. Anand Krishna, Banaras Hindu University, Varanasi. 1978 M.A. Drawing & Painting, Kanpur University Kanpur. 2003 Jehangir Art Gallery, Mumbai. 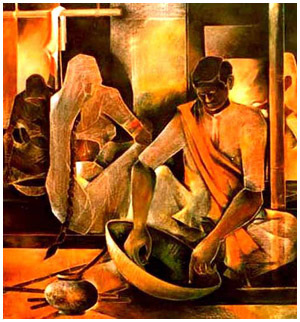 2001 Birla Academy of Art and Culture, Kolkata. 2000 Design Art Gallery, Dubai. 2000,1998,96 Lalit Kala Akademi, Rabindra Bhavan, New Delhi. 1999 Lalit Kala Akademi, New Delhi. 1999 All India Fine Art & Craft Society, New Delhi. 1999 Art Today, New Delhi. 1998 North East Zone Cultural Centre Allahabad. 1998 Huda Gymkhana Club, Gurgaon. 1977 Shyam Hari Sinhania Art Gallery, Kanpur. 2006 All India Art Exhibition Saharanpur. 2006 Green Wood Art Gallery, New Delhi. 2006 Lalit Kala Akademi, New Delhi. 2005 All India Art Exhibition Akedemy Of Fine Art Amritsar. 2004 Art For Vision,LKA,New Delhi. 2005 Inter-State Exhibition Kolkata State Lalit Kala Akademi, UP. 2005 State Lalit Kala Akademi, UP. 2005 Regional Art Exhibition Ghaziabad. 2004 State Lalit Kala Akademi,UP. 2004 Regional Art Exhibition Ghaziabad. 2004 All India art Exhibition State Lalit Kala Akademi,UP. 2004 Inter-State Exhibition Ahmedabad SLKA,UP. 2003 Regional Art Exhibition Noida. 2002 Regional Art Exhibition Meerut. 2001 Regional Art Exhibition Noida. 2001 43rd National Exhibition of Art organised by Lalit Kala Akademi, New Delhi. 1992,91 National Art Fair, Bombay. 2005 Akedemy Of Fine Arts Amritsar. 2004 Uttar Pradesh State Lalit Kala Akademi award. Hotel Inter Continantal New Delhi. Various private collections in India & Abroad. 2005 All India Artist Camp Org. by WISDOME, New Delhi. 2005 Senior Artist Camp, All India Fine Arts And Crafts Society, New Delhi. 2005 All India Kala Utsav Ghaziabad. rganized by All India Fine Arts And Crafts Society New Delhi. 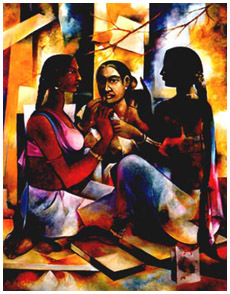 2004 Bangalore International Art Festival And Painting camp Bangalore, Organized by Mantram Art Foundation. 2001 All India Fine Arts And Crafts Society New Delhi. 2000 All India Artist Camp Shimla. 2000 All India Artist Camp Agra (Institute Of Fine Arts Agra). 1993 All India Artist Camp Kurukshetra University, Kurukshetra. 1990 All India Artist Camp Kanpur(organized by LKA New Delhi & SHILPI Kanpur). 2006,05 All India Art Fest Ghaziabad. 1999 Srijak, artist group Ghaziabad.